Last week we warned you that this was the season of the Petes. Hammond may not be what he used to when he racked up 88 worthless ad quotes in one calendar year. But after the hope that maybe even Travers was not being as generous as he has been in years past, we are left with the hopeless fact that he is probably headed for another 60-quote year. Anything under 50 is the ceiling we have been trying to set for this hyperbolic buffoon. That would be progress. Further progress even as we have entered October and there are only four names on the Criticwatch list that have reached double-digits in quotes. There are plenty hovering around eight and nine with several weeks to go, but we have managed to keep these features to more monthly or seasonal check-ups than weekly. Leave it to the whoriest of the whores to change that schedule though. The tenth month has just started and he's already been seen on three ads; two of them for films a full month before their release. We showed you how familiar his words for Captain Phillips were. Not only has he added to that, but has whipped out some of his old favorites on what is already the best-reviewed film of 2013. 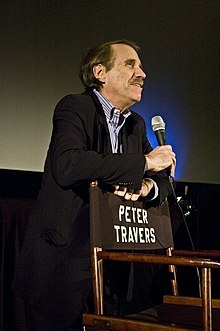 A quick refresher on Peter Travers and Captain Phillips as seen in the commercials. The adjective they are really banking on to describe the film though is the following. Watch as Travers quickly takes the meaning out of it. Let's start with the first bit, shall we? The "surprises you don't see coming" line is a new one. 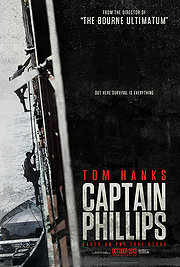 An odd one too considering that Captain Phillips is based on an infamous true story with a well-known outcome. Perhaps there is more to the story that Sony is keeping Chicago critics from until the week of release, but that hardly correlates to what is anticipated in terms of movie "surprises" and "twists." We did examine that a bit last week too in regards to Travers' praise of Prisoners. You know, maybe we wouldn't see the twists coming, dummy, if you didn't tell us they were there in the first place. How do you respond to that, Peter? Apparently, except Travers. As usual. Try a thesaurus sometimes, Peter. It's a wondrous tool for a writer in a brain pinch. And you sure could have used it in your review of Gravity. "The Mexican-born Cuar�n is a true visionary. In tandem with the Bullock tour de force � she blends ferocity and feeling into a triumphant, award-caliber portrait of grace under pressure � he turns Gravity into a thing of transcendent beauty and terror. It's more than a movie. It's some kind of miracle." That is in his Rolling Stone review. We haven't even gotten to the ad yet. Read it again if you must and then continue. Now we get to the newspaper ad. 98% approval at Rotten Tomatoes. The glorious reviews that have been pouring in non-stop since the Venice Film Festival were enough to keep Warner Bros. from its usual stable of whores. Yet they put Travers right at the top. You'll notice back at the review the line reads "In tandem with the Bullock tour de force" as opposed to "Bullock is a tour de force." With or is, it's all the same to Travers. "It's more than a movie, it's a gift." Which brings us back to miracles. Those of us critics who may consider words like "miracles" to be a sacred word - not necessarily in a holier than thou way, but just as one that should be reserved for films like Gravity, should take offense to hearing Travers use it. If you recall the old Father Guido Sarducci joke about the Pope "just waving" the fourth miracle needed to canonize Mother Teresa to sainthood, that is what it is like to see Travers throwing the word around willy-nilly. And boy does he ever. The only miracle left is the one where we never see Peter Travers' name in an ad ever again.